We’re nearly at the end of 2017, so at this half-way stage of the season the team here at CaughtOffside are ready to give you our predictions for the second half of the campaign. 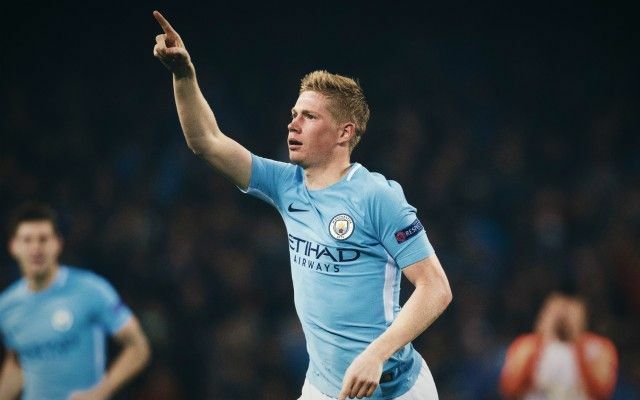 Kevin De Bruyne is a popular choice for Player of the Year, but one member of our team actually believes there could be a shock twist in the Premier League title race! Man City. And I’d be surprised if they didn’t break the Premier League records for most points and biggest winning margin. United and City, obviously, look nailed-on for the top four. After that, it looks like two from Spurs, Chelsea and Liverpool. The Reds could easily mess up my prediction but I just can’t see Arsenal getting into the Champions League unless they win the Europa League. Brighton don’t have many players who seem capable of proving magic. Ultimately, I expect their lack of top-level stars – coupled with their modest January budget – to see them return to the Championship. Stoke are the worst team I’ve seen this season but I think they will be OK once they replace Mark Hughes. An improvement in the Potters’ fortunes could signal trouble for Swansea and Newcastle. Can Harry Kane win the Golden Boot for a third season in a row? Harry Kane has not yet hit top form this season, yet he is still very well placed in his bid for a third consecutive Premier League top-scorer trophy. Unlike some of his rivals, Kane is pretty much guaranteed to start every game when fit. That and an inevitable burst of hat-tricks will see him land another Golden Boot. The Player of the Year award is usually reserved for a representative from the Premier League champions, but if Mohamed Salah is half as good in the second half of the season as he has been in the first, it will be impossible to look beyond the Egyptian revelation, regardless of where Liverpool finish. Marcus Rashford only exited his teen years when he turned 20 this Halloween. That’s a scary thought for the Premier League defences he is set to terrorise for another decade-plus. In Harry Kane, England will boast one of the best strikers at the World Cup, but the Three Lions don’t really have strength in depth in central attacking areas. Defoe is an excellent option off the bench. His ability to find a yard and get a meaningful shot on goal from the tightest of spaces is not matched by Daniel Sturridge or even Jamie Vardy. Manchester City. Might as well give them the trophy now. Call me crazy, but I can really see Chelsea slipping away in a close-run battle for the top four this season. While it’s not exactly the 2015/16-style collapse from the reigning champions, they’ve had a poor transfer window again and the spirit at the club just isn’t what it needs to be. If they don’t improve, Liverpool and Arsenal have enough in them to pip them to Champions League qualification. Swansea, West Brom, West Ham. David Moyes has got off to a bright start with the Hammers, but I can’t see it lasting. They’re a poor side and could easily get dragged down into the bottom three. I might look a bit silly for this, but I’m going to back Liverpool’s Mohamed Salah to continue his scoring streak. This Reds side is set up perfectly for him and there’s no reason he can’t continue to take advantage of their free-scoring approach to pip the likes of Harry Kane to the Golden Boot. Kevin De Bruyne. The best all-rounder in the country and set to play a key role in an easy City title win. Leroy Sane for me. The German is an outstanding talent and it would be a crime if his contribution to this City side were to go unrecognised. Charlie Austin is in a rich vein of form and while it might not be the wisest move, it’s one you can totally see England trying their luck with. City will throw it away, mark my words. Man Utd, Man City, Chelsea, Arsenal. Man City, Man United, Chelsea, Liverpool. Can Charlie Austin keep up his form to earn an England call-up? Man City, United, Chelsea, Arsenal.